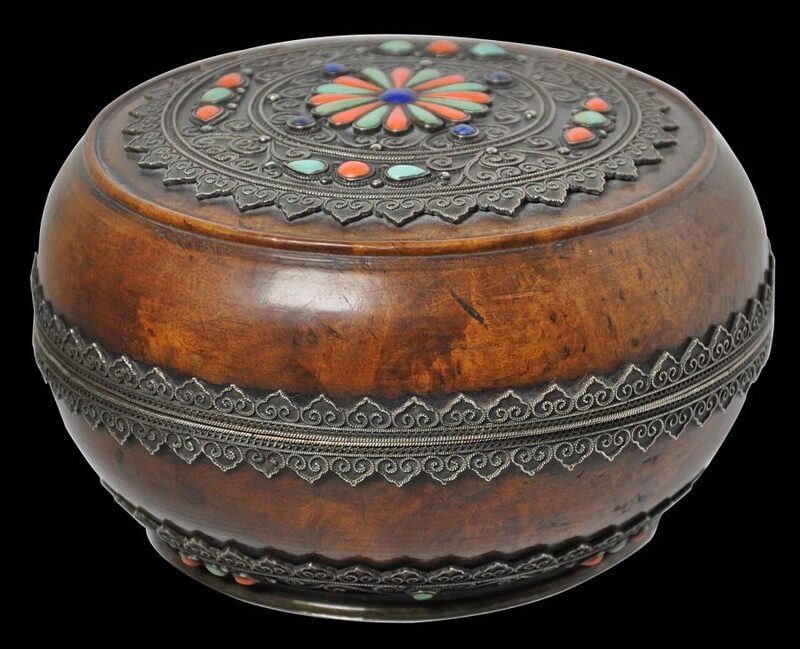 This splendid tsampa box comprises a bowl and cover. 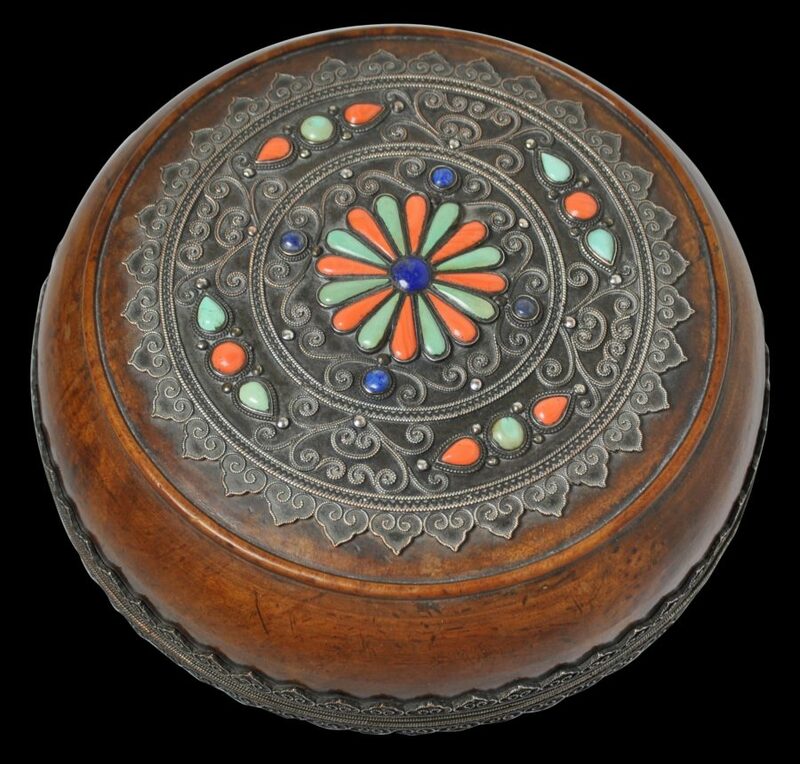 It is made of turned burlwood, probably rhododendron burlwood, with silver mounts that have been overlaid with fine, pearled, silver wire filigree and inset in box settings with lapis lazuli, coral and turquoise cabochons. The box is of flattened spherical form. The cover has a silver roundel to the top that has fine petal scallop edging, and is decorated with fine filigree scrollwork. 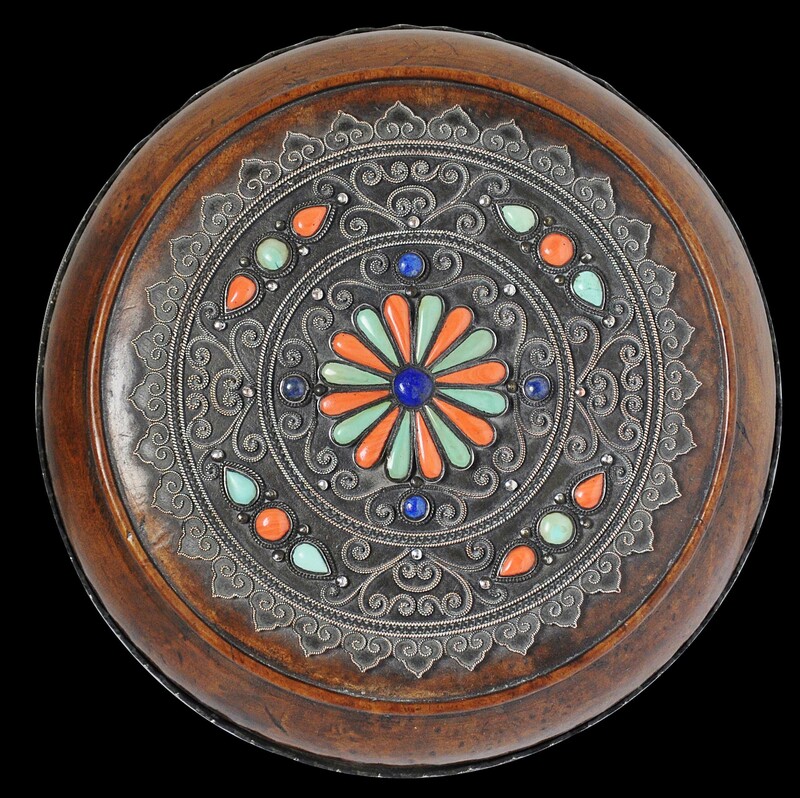 A central floral cartouche is inset with a central lapis lazuli stone and surrounded by elongated ‘petals’ of alternating coral and turquoise. The soft orange-red hue of the coral suggests it comes from the waters around China, rather than having the more brighter red hue that is more typically found on Tibetan pieces for which the coral is more likely to have Mediterranean origins. 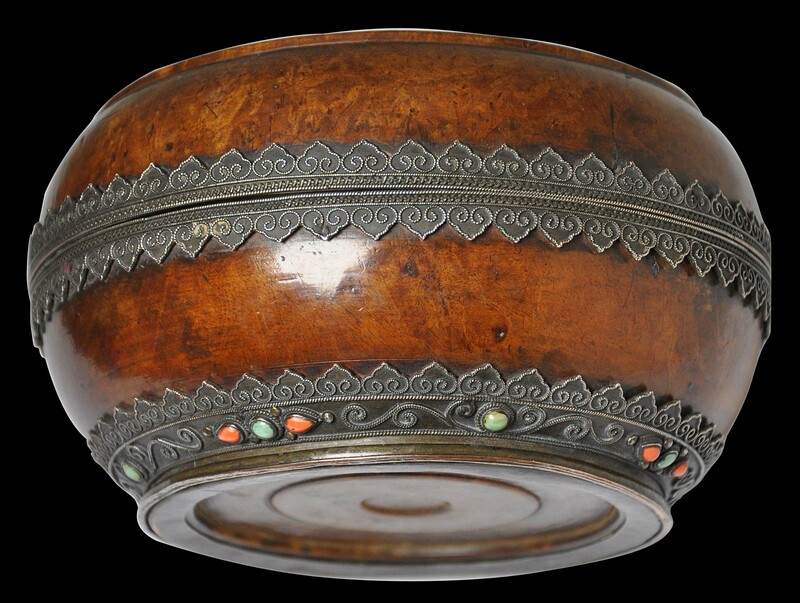 The pearled filigree wire work is also typical of Mongolian work. 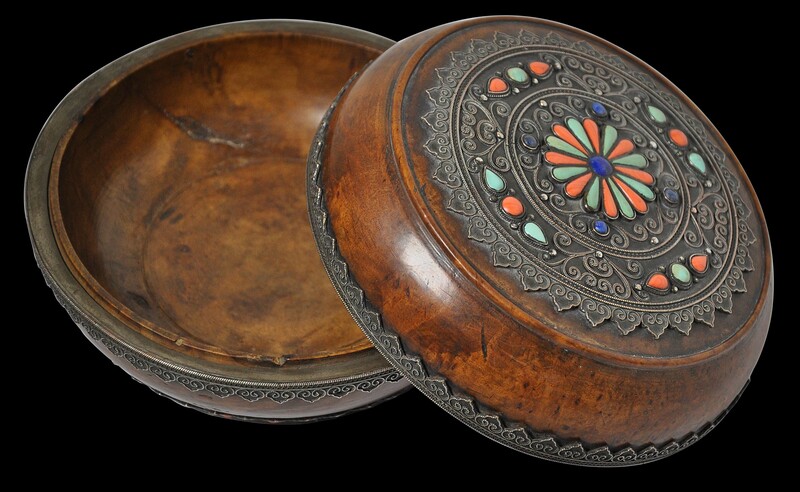 The rims of the cover and bowl are mounted with silver bands overlaid with filigree and edged with petal scallops. The lower part of the base of the bowl is similarly decorated with silver but which is also decorated with semi-precious stone cabochons. 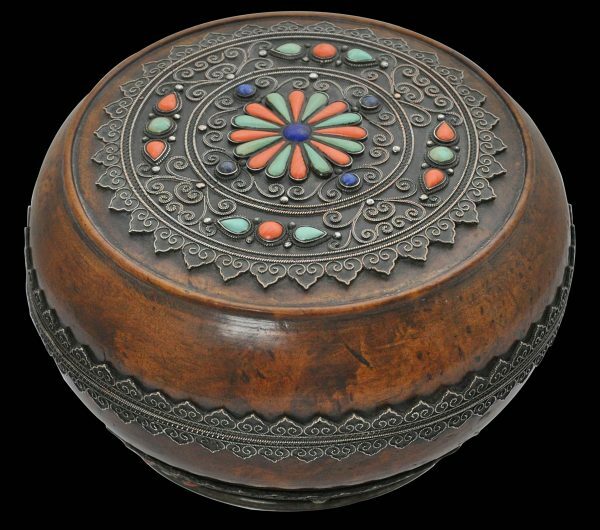 Tsampa boxes are closely related to the tea bowls used in Mongolia and Tibet in terms of their form and the materials used in their construction. They were used to hold and serve tsampa, a ubiquitous Himalayan staple food made from ground parched barley grain mixed with salted yak buttered tea. The box is in excellent condition. It has a superb patina, the wood having a lustrous glow. The silver has not been polished; we have left it in its patinated state. 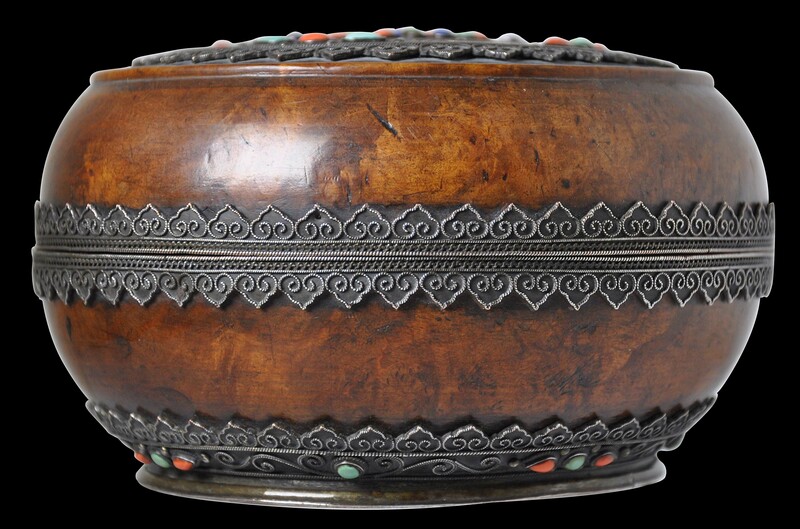 Sheeks, R., ‘Tibetan and Mongolian tsampa boxes’, Arts of Asia, March-April 1996.